Welcome to our wool-shop! If you are looking for our silk yarns, please visit http://www.etsy.com/shop/DyeForYarn (our other yarn shop ;-)). Free domestic shipping (within Germany) for orders over 50 Euro! We dye small batches of natural yarns in vibrant colours. If you'd like to know a little more about us and our dyeing techniques, please visit our homepage www.dyeforyarn.com! Wenn ihr mehr über uns und unsere Färbetechniken erfahren wollt, besucht doch unsere homepage http://www.dyeforyarn.de! **ATTENTION**: Please note, that we can't offer reservations anymore. Custom orders will be listed as reserved in the future as before, though. Visit our brick and mortar shop! Besucht uns in unserem Wollladen! You can also find us on ravelry under the names Kalessin and Haramis17! We also have a group on ravelry (DyeForYarn) where you get all the updates! High quality yarn with beautiful sheen; great color very close to how it appears on my monitor, so it will go perfectly in my planned project. Arrived well within the expected time frame. Excellent purchase! We get our yarns on cones or already skeined in 50, 100 or 200g hanks. We skein the cone yarns on this skeining machine, built by Nicole's husband (an engineer). The drying process is very classical on regular laundry racks with a dehumidifier installed in the room. In our "old life" we were scientists for biology and molecular medicine at University Erlangen-Nuremberg. As science itself is a rather unsatisfying business we started knitting lace shawls in our free time, which soon lead to a need for lighter weight yarns. At that time we weren't able to find lace yarns in Germany so we decided to try dyeing them on our own. A new hobby was born that soon became a passion. Dies hat uns so viel Spaß gemacht, dass schnell klar wurde, dass sich in kurzer Zeit ein erheblicher Garnüberschuss einstellen würde. So hat Cordula beschlossen, unsere ersten Produkte auf der Online Plattform Etsy zu verkaufen. Innerhalb eines Jahres konnten wir immer mehr Kunden von unseren Produkten überzeugen, was einherging mit einem Ausbau des Angebots an Farben und Garnqualitäten. Das Produktionsvolumen erreichte jedoch nach eineinhalb Jahren Ausmaße, die nebenberuflich nicht mehr zu bewältigen waren. So entschlossen wir uns, den Schritt in die Selbständigkeit zu wagen. 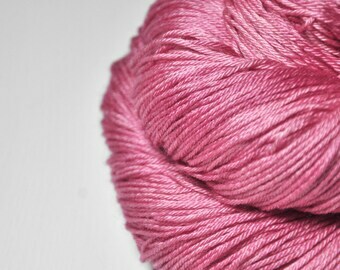 In our shop we sell hand dyed semi solid and solid yarns for lace knitting. All pieces are created by hand, so slight variances are possible between two items. We use professional acid dyes from Ashford and afterwards unscented SOAK detergent to wash out excess dye. To avoid any pests we stash our yarns with lavender and anti moth papers in a smoke free environment. We try to take as acurate pictures of our yarns as possible, but as every monitor displays colours in a different way we cannot guarantee that picture and yarn matches exactly. To avoid any disappointments we also try to describe the quality of the colour. Please contact us, if there are any problems with the products. We’re sure that together we can work something out! Sollte es Probleme mit der Lieferung o.ä. geben, bitte schreiben Sie uns an. Wir sind uns sicher, dass wir gemeinsam eine Lösung finden. We accept Etsy gift cards! It's possible to buy as "guest" here on Etsy and to pay as "guest" with PayPal. You don't need to create a PayPal account in order to do so. German customers also can pay via Sofort Überweisung - for this please add the yarn to cart (do not use "Buy it now") and check the option "Sofort" in your cart. Shipping charges are actual cost. Shipping is within one to three business days after we receive payment. We ship with Deutsche Post without tracking. For combined shipping please leave a note in ALL your orders.
! Please do not use a "Postfililale" address because our default shipping can not be delivered to such an address ! To make shipping costs as cheap as possible for you we will pack the yarn inside a small plastic bag and then in an envelope. The envelopes can be filled with 400g of yarn. If you buy more than 400g, we have to divide the order in two parcels and so on. If you want all of your skeins sent in one large parcel instead of many smaller envelopes, we have to charge extra shipping costs with a separate PayPal invoice. If you'd like to have this special shipping, please send us a note during checking out with your order. Please be aware that these are estimates. Sometimes it can take longer but it can also arrive faster. Please note, that we can not offer reservations anymore. Custom orders will be listed as reserved in the future as before, though. Wir können leider keine Reservierungen mehr anbieten, da es in letzter Zeit etwas überhand genommen hat. Nach wie vor werden aber Wunschfärbungen als reserviert eingestellt. All our yarns are dyed by hand in small batches of up to 6 skeins. We have a mix of reproducible and one of a kind colourways (marked with OOAK in the title). Please understand that it will not usually be possible to match colours exactly. Knots/joins - these are an unavoidable part of the spinning process so you may occasionally find a knot or join in a skein. We all hate them but it's a fact of life we have to live with - not even commercially available yarns are immune! Our yarns are sold by weight. Please be aware that yarn, especially silk, can absorb up to 7% moisture or humidity so may weigh slightly differently depending on your climate or weather. To fulfil your order, you must provide us with certain information (which you authorized Etsy to provide to us), such as your name, email address, postal address, payment information, and the details of the product that you’re ordering. You may also choose to provide us with additional personal information (for a custom order of yarn, for example), if you contact us directly. Service providers. We engage certain trusted third parties to perform functions and provide services to our shop, such as email provider and accountancy. We will share your personal information with these third parties, but only to the extent necessary to perform these services. We may store and process your information through third-party hosting services in the US and other jurisdictions (we use Googlemail as our email provider). As a result, we may transfer your personal information to a jurisdiction with different data protection and government surveillance laws than your jurisdiction. If we are deemed to transfer information about you outside of the EU, we rely on Privacy Shield as the legal basis for the transfer, as Google Cloud is Privacy Shield certified. For purposes of EU data protection law, we, Nicole Eitzinger and Cordula Surmann-Schmitt, owners of DyeForYarn GmbH, are the data controllers of your personal information.